The Spirited ‘CrossOver’ is an ideally suited cruising design which can perform equally well under sail or motor. In the cruising environment it is always an advantage to have good motoring speeds and sufficient power in reserve when required. However given the excellent sailing performance inherited from the Spirited 380, the Spirited ‘CrossOver’ will sail extremely well and not be reliant on the motors when sailing conditions are favorable. In a lot of cases ‘motor-sailors’ are expected not to perform well under sail, and many don’t. 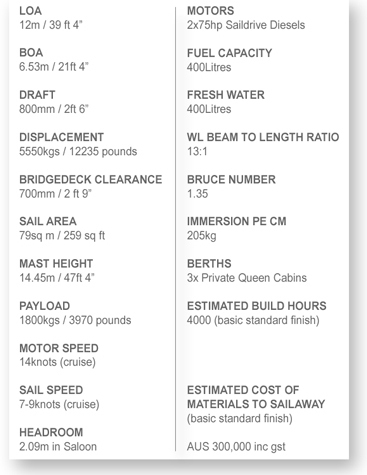 The hull modifications will not hinder sailing performance greatly. But under power they will come into their own with performance characteristics and handling very similar to other semi-displacement designs. Designed as the ‘perfect’ cruising getaway vehicle, the CrossOver can be fitted with all the usual cruising gear to facilitate a comfortable liveaboard situation. Being comfortable and fully self-sufficient is the key to enjoying the cruising lifestyle. The Spirited ‘CrossOver’ will take you to your favourite destinations in comfort and safety with more control over schedules and time lines. In the quest for the ‘ideal’ cruising vessel there are many different opinions from sailors world-wide as to what makes for the ‘perfect’ cruising design. It makes sense to incorporate trends into this concept from our ever-changing social habits. People are now busier than ever with time being in short supply. Travelling is no exception with tight schedules being applied to our holidays. Therefore would logic not dictate that these trends be reflected in the ‘perfect’ getaway vehicle, the Spirited ‘CrossOver’. One of the major downsides to cruising or even short tips away on a sailing boat is that the wind doesn’t always cooperate and blow in the right direction or in some cases there is no wind at all. This can be very frustrating if you have time constraints such as having to go back to work etc! But even in the case of long term cruising, this can be limiting because it is not uncommon to be held up somewhere for days and even weeks waiting for wind to change or weather conditions to improve. Sail and Power The Spirited ‘CrossOver’ bridges the gap between sail and power. Now ‘motor-sailors’ are nothing new but optimizing the performance in both areas is where the challenge lies. Because this design is based on the highly successful Spirited 380 which has now become known for its outstanding sailing performance, the sailing performance of the ‘CrossOver’ is assured even though there has been design modification made to the aft part of the hulls, and the rig size has been reduced. Importance has been placed on ease of handling; this led to the rig and sail area reduction. There is also no sense in having a large performance rig which creates a lot of windage when motoring. A compromise must be struck when marrying two worlds together with a design concept such as this. Rig The rig design has been moderated to keep the windage down when motoring. Sailing performance will still be very respectable given the light-weight structure and easily-driven hulls. Off the wind this design will excel with the planing aft hull shape assisting in wave surfing and general planing. Designed with a central steering position all control lines can be run to this location. Engines Powering the Spirited 'CrossOver' are two 75hp inboard engines with shaft-drive installation. There is also the option of using saildrive engines which can be fitted further aft in the aft cabins. Another option is to fit a larger alloy saildrive engine such as the 40hp Lombardini below the aft steps. This keeps the engine located outside of the accommodation area as per the Spirited 380 design. Interior Internally the volume is the same as the Spirited 380, as is the basic layout design except for a couple of areas. The saloon still has the generous seating design set forward and slightly to Port. On the aft bulkhead in an L shape on the Starboard side is the galley. Layouts There are quite a few layout variations for this area for those wanting options. Visibility forward features not only large windows on the cabin front slope but a line of vertical windows below these. These vertical windows also provide visibility from the forward cabins when in the bunk. Moving down into the hulls there is a self-contained double cabin aft and two mirrored forward cabins with queen sized berths. Off these cabins is either an ensuite which can also have the option of a shower inclusive or a walk-in-robe. The head is aft of the steps leading into the Port hull. On deck This design shares the uncluttered deck layout of the Spirited 380 with good footing throughout with level surfaces. The Spirited 'CrossOver' is supplied as a DIY kit package for easy assembly or the building plans can be purchased separately. Kit packages are available for this design and the options can be viewed in the CrossOver Kit page. How to Order your Spirited Crossover? On receipt of your order form we will provide you with an order confirmation with the costs and deposit requirements. Generally a deposit is made at order and a final payment is made prior to dispatch. Payment for the larger design range is generally made via direct deposit and these bank details are provided on your order confirmation. Payments are made in Australian dollars. Estimated delivery times is provided on the Order confirmation. We will contact you with a delivery date and delivery options once the kit has been ordered. 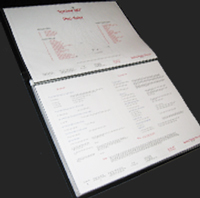 Printed to order with customised cover sheets and any other design requirements to meets the clients requests. Pre-cut to order as standard or to meet any specific customised requirements. Built to order as standard or to meet any specific customised requirements.